Veterans and National Guard members in Alaska and every other state are offered a hiring preference for employment in the public sector, but private employers are precluded from offering a similar preference under the Civil Rights Act of 1964 unless the state passes authorizing legislation. HB 2 is the authorizing legislation for the State of Alaska. Today’s passage of HB 2 makes Alaska the 38th state to adopt legislation to give private employers the option of offering a veteran hiring preference. House Bill 2 passed the Alaska House of Representatives by a unanimous vote of 39-0 in March of last year. 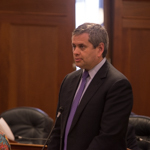 Today, the Alaska State Senate passed the bill by a unanimous vote of 19-0. House Bill 2 will now be sent to Alaska Governor Bill Walker for his signature.